Samsung's shares have fallen on hard times ever since word on the grapevine leaked by analysts and Korean publications that the company has reduced the parts orders with suppliers for the flagship Galaxy S4. Samsung lost about $12 billion in market cap during the process, and now it has taken a beating again. 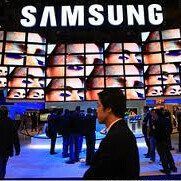 On Wednesday during regular trading hours on the Korean stock exchange, shares of Samsung Electronics fell another 3 percent, dropping to a nine month low, on rumors that it is going to report diminishing earnings for the April-June period, compared with the analysts' predictions. The shares have been falling for a sixth consecutive session, despite Samsung rocking announcement many new products in the last few weeks - most of the bread-and-butter new mobile devices were niche versions of the Galaxy S4 like the Zoom or Active, while the big innovations came with Wintel products like the ATIV Q convertible, rather than in mobile, where Samsung's margins are much higher. So we can die in a pool of our own blood outside an opera-house with our helpless child crying over our lifeless corpse. Just release note 3 now, or your share will go DOWN!! They are repeating the mistakes of HTC.. They have released more than 5 variants of GS4.. Thats what HTC had done with their One X. One X, One X+, One XL.. Note 3 will succeed for sure. This is the first that you are agreed with me. Peace. Regards, Potato. One of HTC's mistakes was not following up great phones with great phones. EVO was outstanding, EVO 3D fail, EVO Shift fail, EVO Design?. wait.did u just ask sammy to release new phones?dafuq are you saying? they release new phones every week no matter what. Lol yeahh but I meant for high end phones . Margins on high end PC's like ATIV Q also will be high. But the problem is they wont sell as many of those products like Smartphones. unless the note 3 is a major breakthrough, or else samsung is gonna have a hard time while OEMs like HTC, sony and LG are emerging. Samsung sold 31% more smartphones in the first quarter over last year just in Europe, so what hard times are coming exactly? The Ativ like-up looks spectacular with Q-like solutions having epic potential, the Note III and Androir DSLR are hotly anticipated, Tizen phones are coming and then next year flexible displays will change everything, guess who's leading that race. Well said bone completely agree with you, Samsung are too big to fall that quickly besides Samsung always has something up their sleeve! It will fall, it's just matter of time, and how fast it falls. The high-end market is now diluted due to the onslaught of cheaper sub $200 Android phones, the gap between high end Qualcom and entry level quad core Mediatek phones is too close now in terms of features vs price difference! And this didnt exist a year ago!....I think the trend will still continue ..regardless as to whether the NOTE 3 will present some killer features or not Apple isn't exempted either. The fall of the GIANT!